The Email Your Subscribers option is a do-it-yourself feature, available to all Perfect Patients’ clients. How Do I Send a Personalized Email to All Subscribers? Hover over the Email tab in the left menu and click Send Email from the drop down menu. You will be presented with a blank email template ready for you to type or paste your content into. Once you’ve completed your email, we recommend you use the Send Test button to send yourself a proof of your email before sending it to all subscribers. When you’re happy with how your email looks, click the Send button to send to all subscribers. You can also click on the Schedule button to send the email on a specific day and time. How Do I Send a Personalized Email to One Subscriber? Click on the Email Envelope Image to the right under the Actions column. You can also choose a template that is already written and send that to your subscriber. 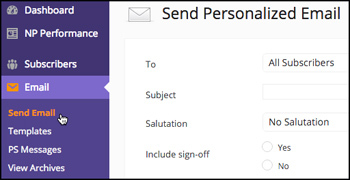 Once you’ve completed your email, we recommend you use the Send Test button to send yourself a proof of your email before sending it to your subscriber. 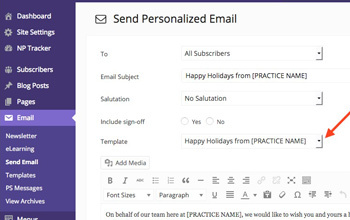 When you’re happy with how your email looks, click the Send button to send to your subscriber. How Do I Add a Hyperlink to a Personalized Email? Highlight the text that you would like hyperlinked in the content of your blog post. Click the Insert/Edit link button in the toolbar. Enter in the destination URL and then click the Add Link button. How Do I Add an Image to a Personalized Email? You can either drag and drop the file from your computer onto the area of the dialog box marked Drop Files Here, or click the Select Files button to locate and upload the file from your computer. Once the image has been uploaded, and you have selected the options you like, click Insert into Post and your image will appear in the email you are editing. NOTE: Images can not exceed 540 pixels in width and 3MB in total file size. If you are not familiar with how to edit an image, please contact your Website Success Manager (Premium subscribers only) or reach out to our Client Support Team (support@perfectpatients.com) and we will have one of our design specialists do this for you. How Do I Add a PDF to a Personalized Email? Simply position your cursor in your email where you want the link to your PDF file to appear then follow the instructions below. Click the Add Media button. You can either drag and drop the file from your computer onto the area of the dialog box marked Drop files here, or click the Select Files button to locate and upload the file from your computer. Once your file has uploaded the Page Properties will appear in the right column. Enter the text that you would like users to click on in your email (ie: “Click here” or “Download flyer here”) to the Title field. The “click here” link (or whichever text you entered in Title) will appear in your email, linked to the PDF file you just uploaded to your website. When Will the Personalized Email Send? Once you have selected to send your Personalized Email to your subscribers the email is added to the queue and will send on the upcoming hour (or very closely to it). For example, if you clicked the Send button at 10:35am your Personalized Email will send close to 11:00am. The queue is in place to ensure optimal email deliverability. How Do I Add a PS Message? Choose a template from the list under “Template” to review the content, edit or add an image. Choose who you would like to send it to then decide on a salutation and a signoff. Before you send it, scroll to the bottom of the email and click on the “Send Test” button to send a preview to yourself. Once you are happy, scroll to the bottom again and click on “Send Now”. Your email will be added to our queue and sent out within the hour! How Do I Create My Own Custom Template? 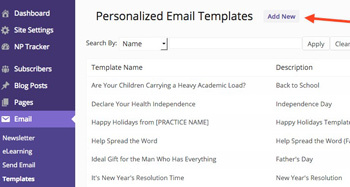 You can create your own custom template if you like to send out to your subscribers. Click on the “Email” tab in the left side of your dashboard. Add a Template Title and a description then add your text using the formatting tools and “Add Media” button for images. When you are ready you can use the “Preview Template” button at the bottom to see how it will look. When you are happy with the results, click on the “Save Template” button also at the bottom. 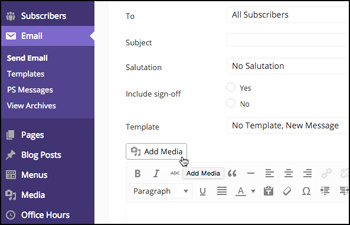 Your custom template will be saved in the list and is now available to be sent to your subscribers from the “Email” module. Happy Templating!